Gosh, it really took a while for this book to come out considering the previous costume book Dressing a Galaxy which came out in 2005. It's a huge 226-page hardcover with lots of wonderful photos and in depth writeup. Fantastic, just like the earlier book. 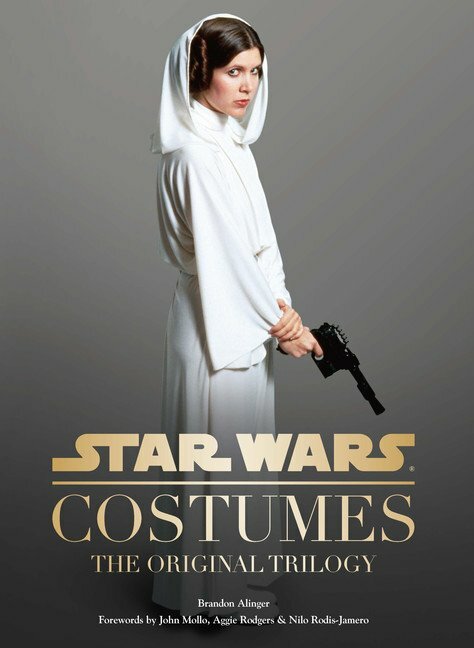 Star Wars Costumes focuses on the costumes created for Star Wars original trilogy Episodes IV, V and IV. It's really cool to look at the huge variety of costumes used in the movies. There are costumes for Chewbacca, R2-D2, C-3PO, Boba Fett, bounty hunters, Princess Leia's skimpy slave dancer outfit, Darth Vadar, Stormtroopers and many more. Across the movies, there are also updates to the costumes so you'll get to see Darth Vadar's original and the updated one after A New Hope. What I find interesting is to see that most costume designs have aged quite well while some not so well. The photographs are great. They are high resolution with close ups just in case you want to examine the seams. There are photographs almost on every page. Some sketches and concept designs are also included. The text is even more in depth compared to Dressing a Galaxy, talking about the making of those costumes. Forewords are written by costume designers John Mollo, Nilo Rodis-Jamero and Aggie Rodgers. It's a very insightful writeup by author Brian Alinger. Highly recommended to all Star Wars fans. By the way, there are two publishers for this book, namely Chronicle Books who is distributing for USA and Canada, and Titan Books for UK, Europe and other places. Mine's the Titan Books edition and it has 226 pages, but I see that Chronicle Books listed theirs as 232 pages. Strange.